It’s nearly time for the return of Burnside Park beer gardens, outdoor evening concerts and storytime mornings—along with a host of new programs starting this summer! On June 23rd, 2012 Greater Kennedy Plaza and the Department of Art, Culture + Tourism are kicking off the summer season with the 1st Annual Summer Solstice Celebration On the Plaza! A FREE, all-day celebration including live art-making, family activities and performances, food trucks, the return of the Burnside Park Beer Garden and an evening of fun music! Details below! 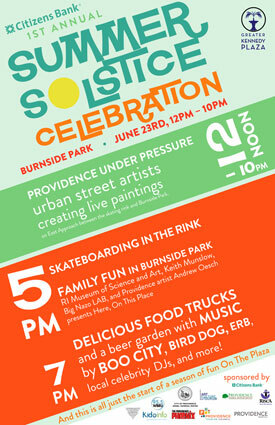 12 noon – Celebration kicks-off with RISD alum Yarrow Thorne’s Providence Under Pressure: Urban Street Art Exposed an interactive art display with urban street artists creating live paintings on East Approach between the skating rink and Burnside Park. 5:00pm – Family fun in Burnside Park begins with musical performance by KEITH MUNSLOW! Come discover amazing exhibits by the the Rhode Island Museum of Science and Art, join in a large-scale interactive mapping project by Providence artist Andrew Oesch and catch special appearances by BIG NAZO LAB throughout the evening! 6:30pm – Local celebrity DJ’s keep the mood lively while adults can sip refreshing craft brews in the first BEER GARDEN of the summer season and enjoy dinner from one of GKP’s fantastic food trucks. 7:00pm- The EXTRAORDINARY RENDITION BAND herald in a new season in Burnside Park and help welcome Mayor Angel Taveras. 7:30pm- Evening concert in Burnside Park by BIRD DOG, a Brooklyn based outfit with a sound that draws on a wide set of roots influences. 9:00pm-Providence’s BOO CITY caps off the evening with their dynamic meld of black country, soul and rock steady music! Special thanks to our sponsors: Citizens Bank, the Providence Department of Art, Culture + Tourism, RISCA, Providence Tourism Council, RIPTA, Providence Monthly, WBRU, and Providence Phoenix!